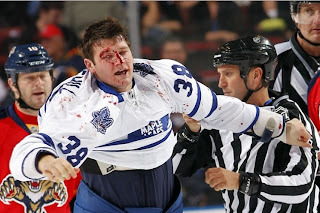 The fight of the week comes from a game this past Tuesday between the Toronto Maple Leafs and Florida Panthers. Early in the game, Jay Rosehill lays a clean check on John Madden. Now I wouldn't say John Madden is a superstar or anything, but Krys Barch took some exception to it. I remember a young Barch when he was with the Dallas Stars a few years ago. He went through the Stars' system as the tough guy enforcer so it's nice to see him still doing his job. A few love taps from Barch and an oblige from Rosehill and off we gooooooo! Rosehill starts off firing rights, but once Barch gets comfortable and a nice grip of the jersey, the bout isn't much of a match. It's an easy win for Barch as he effectively manages Rosehill using punches landing with both hands. He utilizes his strength well as Rosehill is constantly off-balance. So lesson of the night... if you want to land a big hit, be ready to fight.